To fully appreciate the actor's gifts, one must see him in films that were less ambitious in scope. In DESTINAZIONE PIOVAROLO (DESTINATION PIOVAROLO: 1955) by Domenico Paolella he is a station-master sent during Fascism to take charge of a completely insignificant little railroad station in a remote country town and whose mishaps with the authorities prevent him, even after the fall of the regime, from being promoted to a more important place. In UNA DI QUELLE (ONE OF THOSE: 1953), directed by Aldo Fabrizi, he is a provincial "hick" who comes to Rome with a friend on the lookout for easy conquests and runs into a poor widow who has decided to prostitute herself in order to feed her family. AVANTI C'E POSTO (COME ON, THERE'S ROOM), with its sentimentalities, returns, but Totò coupled, as was frequently to be the case, with Peppino De Filippo, draws a penetrating portrait of the middle-aged man in the mood for courtship. In I TRE LADRI (THE THREE THIEVES: 1954) by Lionello De Felice, from the celebrated early 20th century novel by Umberto Notari which had already inspired a film in Czarist Russia, he is a small-time thief who manages to expose the swindles of three businessmen who are bigger thieves than he. 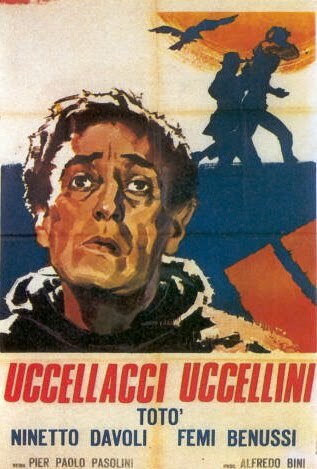 In LA BANDA DEGLI ONESTI (THE GANG OF HONEST MEN: 1956) by Camillo Mastrocinque, he is a poor devil who takes up counterfeiting to stave off starvation, creates counterfeit bills of imcomparable perfection but then, seized by the pangs of conscience, doesn't have the courage to put them into circulation. LA LEGGE E LEGGE (THE LAW IS LAW), directed in 1958 by the French director, Christian-Jaque, is a variation on the theme of GUARDIE E LADRI (COPS AND ROBBERS), set in the Alps on the Italo-French border, a series of ludicrous run-ins between a customs officer (the French comedian, Fernandel) and a smuggler (who is obviously Totò). IL COMANDANTE (THE COMMANDER), directed in 1963 by Paolo Heusch on a script by Rodolfo Sonego, describes the disillusionments of a retired officer who tries in vain to regain an influential position by throwing himself into the business world which he is not cut out for. Along with an extremely controlled Totò there is the elegant vivacity of one of the finest light comedy actresses in the Italian theater, Andreina Pagnani. Towards the end of his life, Totò was engaged by a very particular film author like Pier Paolo Pasolini. The director of utterly tragic films like SALO E LE CENTO GIORNATE DI SODOMA (SALO AND THE HUNDRED DAYS OF SODOM), he never made any authentic comedies. Even so, a certain comic flavor is to be found, in the use of certain mechanisms if nothing else, in UCCELLACCI E UCCELLINI (BAD BIRDS AND LITTLE BIRDS: 1966), a modern fairy-tale entrusted to the genius of a Totò who is himself, down to the "traditional" clothes he wears, and at the same time a symbol of a certain human condition. For his performance, Totò received an Honorable Mention at the 1966 Cannes Festival. Pasolini would use him again in LA TERRA VISTA DALLA LUNA (THE EARTH SEEN FROM THE MOON), one of the episodes in the film, LE STREGHE (THE WITCHES: 1967), and with marvlous results, in CHE COSA SONO LE NUVOLE? (WHAT ARE CLOUDS? ), an episode from CAPRICCIO ALL'ITALIANA (ITALIAN CAPRICE: 1968), where Totò, with his face painted green, is Iago in a scatterbrained performance of OTHELLO in a marionette theater. With Totò and his exceptionaly creativity as a mime, Italian-style comedy possessed the ideal interpreter of that Italian, poor of pocket but rich in spirit, who is one of its recurring figures. Too bad it exploited him to little.